A close look reveals that Excess Cash Reserves at the USFed are being drawn down, which are thus funding the USGovt deficits in the last couple months. Ironically, such reserves held by big banks at the US Federal Reserve were the only thing preventing vast insolvency. Now that cash is being used. Details can be found in the July Hat Trick Letter reports. The data is right before us. Bring the trails and tallies to the table, and it looks like a grand racket worthy of any sophisticated syndicate. Evidence is compelling, and grand motive for foreign creditors to reject the USDollar with all of its active Dollar Dons. When recognized monetization destroys the last vestige of trust and confidence in the USDollar, when more official rounds of sponsored Quantitative Easing arrive, the USDollar will be on a downward spiral. In fact, all major currencies face the same prospect of vast monetary expansion. They will all fall sharply in value, and by counter-effect, the Gold price will skyrocket. This story is a gem. The Chinese Dagong credit agency made an inaugural splash with a debt downgrade of the USTreasury Bonds. They called the US-based trio of debt rating agencies politically biased, an under-statement. The Dagong agency used its first splash into sovereign debt to establish a bold standard of creditworthiness around the world, giving much greater weight to wealth creating capacity and foreign reserves than Fitch, Standard & Poors, or Moodys. They also pay attention to rapidly escalating debt levels. 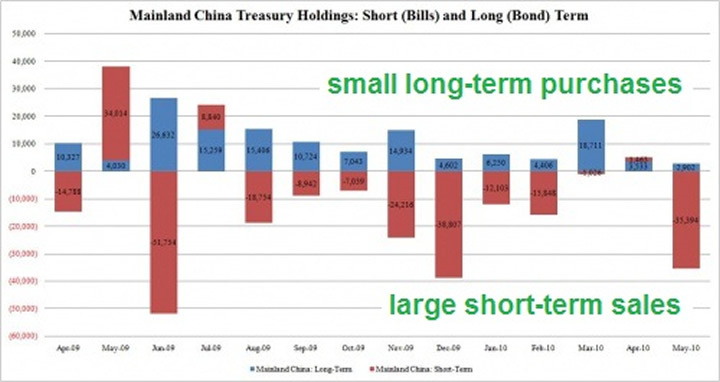 The Chinese Govt has coordinated their strategy, selling off short-term USTreasury Bills, but hanging onto a large raft of long-term USTreasury Bonds. On a net basis, the Chinese purchases have hit a plateau. Meanwhile, with distracting commentary, China has doubled its gold holdings. At least the Chinese Govt thas promised not to use their foreign reserves as a weapon. What a relief!! And Wall Street promises no more bond misrepresentation, no insider trading, no more fraud, no more drug money laundering (see Wachovia & Wells Fargo). What a relief!! The USGovt strives for clarity about management of China's $2.5 trillion in FOREX reserves, the world's largest. It contains $868 billion in USTreasurys at last count. The growing fear is that, in anger over trade friction, or in disgust over horrible USDollar management, or from a response to discovered hidden USTBond monetization, or with ambition to displace the US from its catbird seat, China could dump USTreasury Bonds with a vengeance. The credit market analysts justifiably call it the Nuclear Option. The Beijing officials have given veiled warning to reduce the USGovt deficits and to put aside thoughts of another Quantitative Easing. The next QE2.0 comes as sure as night follows day. The message is written on the wall, that the United States has forfeited its sovereignty with rampant debt production rather than industrial production. Under Goldman Sachs rule, the USDept Treasury is running some bold kind of racket game, whose purpose is unclear, except clearly that it aint honest. The USGovt borrowing through debt issuance was $142 billion more than the June USGovt federal deficit, which means they are doing more than financing the deficit. They are funding a syndicate. In chronic fashion, excess issuance has been the pattern, as the USGovt has issued $1.5 trillion more in debt securities than its budget deficit in the past four years. During the past 45 months, the USGovt has accumulated an incremental $4.7 trillion in new debt, but the federal budget deficit has grown by $3.2 trillion, much less but still a mammoth amount. Nobody asked why so, and nobody asks where the bond proceeds go. One is left to speculate that a vast bold new syndicate technique is simply selling bonds beyond newly formed debt, stealing the funds as proceeds, and tucking the bonds in foreign locations for syndicate usage on rainy days or retirement days. The June USGovt official budget deficit was logged at $68.4 billion. During the same month, the USGovt borrowed a staggering total of $210.9 billion. These are not refinances of USTreasury debt in rollover. On a consistent basis, the USGovt has borrowed much more in each deficit month than was required to close the deficit and finance the debt accrued. The differential of excess debt issuance for the first six months of 2010 comes to a hefty $290 billion, a pattern in continuance. Perhaps the US syndicate maestros figure that with large numbers, nobody will notice, or given the hidden monetization, they might as well put the bond presses in hyper-drive. The cumulative data, as well as the mindboggling differential (dotted line) between the two series is shown on the attached chart. Perhaps it is for war funding far in excess of the stated costs, to save embarrassment and questions. Perhaps it is for enormous vertically integrated business investment in Afghanistan for industrial processing of poppy into heroin. Perhaps it is for the heavily rumored underground cities under construction for elite resident purposes. Perhaps it is extra costs for additional new military bases scattered across the globe. Perhaps the answer is simpler, in that it is just being counterfeited and stolen by the financial syndicate led by Goldman Sachs that controls the USGovt financial ministries, and operates criminally with full impunity (except for meager fines). My sincere belief is that all the above are part of the destinations for the money. This is a smoking gun. This story is a gem. The Chinese dump USTreasurys and England accumulates them. Or more accurately, the USFed hides its vast monetization efforts in the United Kingdom account ledger item. No way to the reasonable man can Britain purchase $170 billion in USTreasurys in five months from legitimate sources of savings!! In May 2010, China reduced their USTreasury holdings by $32.5 billion, now the lowest level since June 2009. China shed $35.4 billion in short-term USTBills, offset by a mere $2.9 billion in purchased USTBonds. Furthermore, Japan reduced holdings in USTBonds, as did the OPEC nations. However, buyers could be found, all Anglo descent, at least on the surface. The total foreign USTreasury holdings rose from $3957 billion to $3964 billion. Attribute the good tiding news to gigantic ongoing accumulation by England, just like the last several years. The UK-based buying is highly suspicious, like a neighborhood crack house purchasing a swimming pool, but arouses no attention except by intrepid analysis divorced from Wall Street or the USGovt, the bicameral syndicate. Generally, the United States financial system suffered a dramatic decline in May as foreign purchases of US assets hit a wall, falling from $110.3 billion to just $33 billion. See the graph of steady Chinese unloading of USTreasurys in the last several months. As of end May, China still holds a gaggle of USTreasurys, but their USTBill holdings are down to a trifling $7 billion, as China sells into the confusion, especially at high principal prices tied to near 0% yields. China is selling the bubble. Without any question whatsoever, the USFed and USDept Treasury are using the United Kingdom as a ledger item for their mammoth USTreasury monetization, all barely hidden, with the TIC data used as a tiny fig leaf to obscure a bulging protuberance. The story receives no mainstream attention. The United Kingdom has wrecked banks, staggering deficits, no trade surplus, yet managed to buy a whopping $28 billion of USTBonds in just the month of May. Seems like Printing Pre$$ operations and London serving as the Hidey Hole. At end 2009, as of the December tally, the UK owned $180.3B in USTBonds, yet somehow managed to accumulate in the new year, up to the current $350.0B. 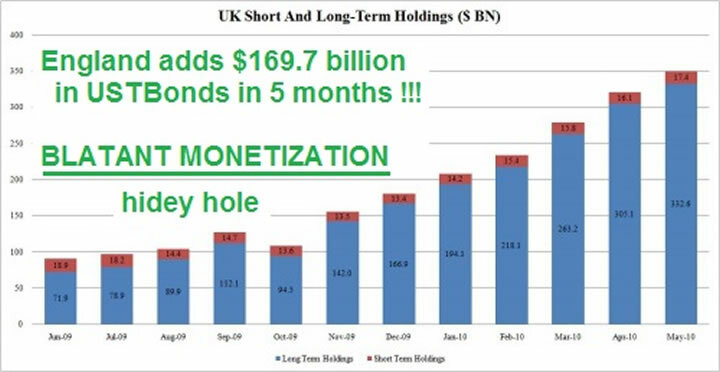 THE UK SUPPOSEDLY HAS ALMOST DOUBLED THEIR HOLDINGS IN A MERE FIVE MONTHS!! Bear witness to the shadow USFed debt monetization operation, operating out of the United Kingdom, or at least its accounting. The hidden USTreasury Bonds reside in England. If truth be known, this is where the owners of the USFed reside. Anyone who accepts the following graph on its face is a blatant moron, a bold huckster for Wall Street, or a dimwitted employee of government. Bear in mind that we are talking about crippled England here, or the United Kingdom more generally. The UKGovt just announced spending cuts to reach 40% of budget, not the previous 20%. Britain could not cope with an extended episode in the credit crisis, according to the Bank For Intl Settlements. Yet this nation gobbled up $170 billion in USTreasurys from ripe savings in five months?? Hardly. The Bank For Intl Settlements has warned that sovereign debt under siege cannot adequate be relied upon as the coupon for broad national financial rescue and stimulus, not again, not in the next round. The UKGovt is admitting openly that the situation is worse than they said before. Newly ordained Prime Minster David Cameron ordered the officials to draw up 40% cuts, the biggest in history. He has ordered cabinet ministers to draw up a Doomsday budget whose essential service spending cuts could see tens of thousands given pink slips. Yet this nation gobbled up $170 billion in USTreasurys from ripe savings in five months?? Hardly. This is a smoking gun. In the summer 2008 leading up the the Wall Street death experience, the British suffered their own shameful episode with Northern Rock, Royal Bank of Scotland, even the venerable Lloyds of London each succumbing, no longer breathing life in a solvent sense. They are all broken, just as broken and insolvent and wrecked as the biggest US banks, all Zombies. Billions of pounds were spent in nationalizing the Royal Bank of Scotland (partial), Lloyds Banking Group (partial), and Northern Rock (total) in an attempt to prevent their collapse. Neither the UK nor the US is on any path of reform or restructure. London redeemed failure from a real estate bust, which is the absolute opposite of investment or stimulus. Yet this nation gobbled up $170 billion in USTreasurys from ripe savings in five months?? Hardly. This is a smoking gun. This story is a gem. Eric Sprott of Sprott Asset Mgmt casts a suspicious eye at the USTreasurys for the so-called Household category in their accounting. It is a blatant ledger item for illicit monetization, a veritable crime scene without the yellow tape. Sprott directs his accusations like a skilled prosecutor. He reinforces the claim of Ponzi Scheme cited by Bill Gross of PIMCO. 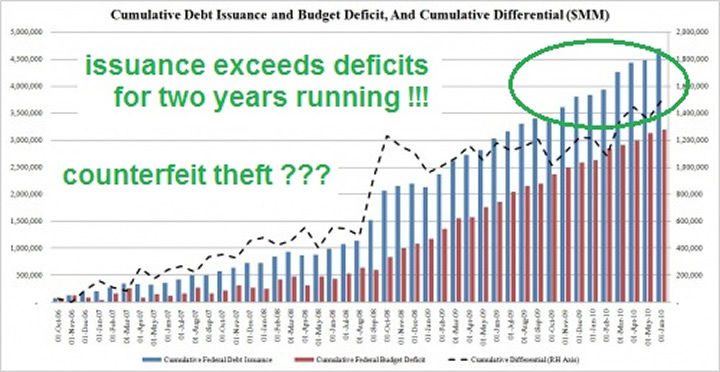 Sprott calls the solution to finance the mammoth USGovt deficits to be the actual problem, namely hidden monetization. The Hat Trick Letter is in perfect synch with his line of reasoning and accusation, as the "Household" accounting ledger item is the culprit. This item has been the topic of past Jackass focus and analysis. Data in bloody detail is offered in his indictment. Sprott points out that in order to balance the budget for fiscal 2009, the USGovt needed to sell $2041 billion in new debt, equal to three times the new debt that was issued in fiscal 2008. Witness the grand rampup without identified sources of buyers, mythical buyers in official USTreasury auctions, fraudulent accounting on the official books. No purchasing groups could could afford to increase their 2009 USTreasury purchases by 200%, a simple conclusion. So by process of elimination, the monetization source arises most visibly, but he shows where it appears in the accounting. In the latest USDept Treasury Bulletin published in December 2009, ownership data reveals that the United States increased the public debt by $1.885 trillion dollars in fiscal 2009. That much is clear. According to this report, there were three distinct groups that increased their purchases from 2008 levels. The first was "Foreign & International Buyers" which purchased $697.5 billion worth of USTreasury securities in fiscal 2009, a 23% rise from fiscal 2008. The second group was the US Federal Reserve itself. Their published balance sheet reveals an increase in its USTreasury holdings by $286 billion in 2009, a 60% annual rise. Consider that jump to be a direct result of the official USFed Quantitative Easing program announced in March 2009. Quick summaries cover the other groups. Q1, Q2, and Q3 data from 2009 suggests that the State & Local Govts and US Savings Bonds groups were net sellers of USTreasurys in 2009. Then the pension funds, insurance companies, and depository institutions increased their purchases by only a paltry amount. The remainder was purchased by a category called loosely "Other Investors" as a catch-all. This other group purchased $90 billion in 2008, but then jacked up in extreme hyper-drive its purchases to $510.1 billion of freshly minted USTreasury securities so far in the first three quarters of fiscal 2009. On an annualized rate of purchase, the catch-all category is on pace to buy $680 billion of USTreasurys this year, over seven times the 2008 level. So the murky vague "Other Investors" saved the day and financed a gargantuan amount of the USGovt deficit. The Federal Reserve Flow of Funds Report defines the infamous "Household Sector" which is a grab bag catch-all miscellaneous ledger item. The Hat Trick Letter has honed in on this corrupted ledger item in past reports. This category supposedly purchased $15 billion worth of USTreasurys in 2008, then jumped with jet (printing press) assist in 3Q2009 to a staggering $528.7 billion in purchases, a 35-fold increase. The Household is on track to buy $704 billion worth in all fiscal 2009. The bottom line is a shocker! What is the Household Sector? It is a combination of miscellaneous, ledger adjustments, and blatant monetization. Sprott calls it a PHANTOM that does not exist, but serves the purpose to balance the ledger in the US Federal Reserve Flow of Funds report. In the past, this ledger item was calculated as residuals, securities on loan across groups, even inclusive of rounding error. The monetization is no longer hidden. He concludes that USTreasurys have become one giant Ponzi scheme, just like Bill Gross of PIMCO quipped. This is a smoking gun. Foreign USTBond holders share their worry openly. Zhu Min is deputy governor of the Peoples Bank of China. In a recent discussion on the global role of the USDollar, he told an academic audience that "The world does not have so much money to buy more USTreasurys. The United States cannot force foreign governments to increase their holdings of Treasuries… Double the holdings? It is definitely impossible." With foreign sources unwilling or unable to support USGovt debt, the monetization card will be used repeatedly and powerfully inside the desperate US-UK quarters. When the process is more widely recognized and publicized, the USDollar will be trashed. It is that simple. No creditor nation whose leaders are in their right mind would continue to support the USDollar as the global reserve currency when its debt securities are the object of colossal fraud and powerful monetization. The USFed Chairman Bernanke before the USCongress testified that the USTreasury is not buying its own debt with printed money. He is a liar. He cannot identify the USTBond buyers. The evidence is compelling, and all around us. One does not have to be an advanced financial engineer to detect the trails of the monetized debt, its accounting location at the Household slot within the USGovt and within the United Kingdom in the Treasury Investment Capital (TIC) Report. The USGovt is racking up gigantic deficits, which will run in the neighborhood of $1.5 trillion annually for some time. The second half recovery claim is for morons. Austerity measures are a pipedream. The wars are both sacred and endless, a shameful badge of honor for a fascist nation. Reform is nowhere. Economic recovery is a mirage. Blown opportunities, wasted bailouts, and lack of solutions like reform & restructure assure a much high gold price. Actually, they assure much lower currency valuations. With the redemption of Wall Street bond failure in October 2008 (see TARP Funds), and the nationalization of failed firms (see Fannie Mae, AIG), and the vacant economic stimulus that served little more than state budget shortfall plugs, the potential for a $2000 gold price was provided. Over $2 trillion was wasted. Debt across the debt-plagued landscape will be monetized. That is a fanciful way of saying newly printed money will be used to buy the wrecked debt, so that it can be shoved under the carpet. But the elephant living under the carpet creates a problem, with size and feces. With the redemption of British bond failure in 2008, and the nationalization of failed firms, the potential for a $2000 gold price was reinforced from the Anglo flank. Over one trillion British Pounds were wasted. Debt across the debt-plagued landscape will be monetized. With the redemption of European sovereign debt in May 2010, and the absence of stimulus in the European Economy, the potential for $3000 gold price was provided. Almost $800 billion was wasted. Debt across the debt-plagued landscape will be monetized. Gold thrives when the major currencies are debased, debauched, and destroyed. The winds are showing strong signals of another powerful round of Quantitative Easing, the so-called QE2. When announced formally, or incontrovertibly detected, the potential for a $5000 gold price will be provided. The USEconomy is moribund, and the EU Economy is moribund. Economic stimulus and monetary accommodations have ended in the United States. The deceptive cry of a second half recovery is met by the arrival of a second half deep swoon. November elections are coming in the United States, when liberal policy, free spending, and reckless decisions are normally made. Numerous smart analysts like Eric Sprott, Jim Grant, Jim Rickards, and Porter Stansberry expect the QE2.0 to set sail soon, maybe announced this calendar year. Some analysts believe another financial market crisis episode will be permitted first, in order to permit an easy political path for the next round of Quantitative Easing. The QE2.0 is assured, not even worthy of a forecast. My forecast is for QE3.0 to be announced by early 2012, and for QE4.0 to be announced in 2013. The reason is simple. Absolutely no effort is being made to fix anything. The objective is to preserve power. Banks still hold tons of toxic debt, as mortgage debt has been written down by $270 billion but residential housing alone has come down $7 trillion in value. Even the SEC head Shapiro admitted that a slew of bank failures are coming soon. Restructure of the USEconomy is not even a topic, as consumption is desired, not seen, as job growth is desired, not seen. Capital formation and job creation are no longer an understood concept within the tarnished marble halls of US economist offices. Return of the US industrial base is not even discussed, a lost bastion. Instead, the priority of banking and political leadership is preservation of power, in order to control the coveted US$ Printing Pre$$. The war machine churns, with huge costs, no debate, no change to believe in. The entire world is working overtime behind conference doors to fashion a new global reserve currency. The IMF Special Drawing Rights vehicle is openly discussed, more like a Straw Man. The New Nordic Euro is a hopeful initiative conducted in secrecy, to be constructed with a gold component. By design, it is to enable a return to monetary system stability. However, by design it is also a USDollar killer. Its arrival will come without any doubt. When it does, the talk will not be about clownish deflation topics. Talk will be about hyper-inflation and the United States facing a Third World prospect. Talk will be about $5000 gold. Talk will be about nothing fixed by the financial syndicate in power. Let's hope by then, the Interpol arrest warrants for many US & UK bankers and some EU bankers are delivered. The warrants already exist and await timing to be served, seen by a friend of a contact. The Jackass proposes the arrest warrants be served at the next Davos Economic Summit. I wrote to my MP about the amount of money we were investing in US treasury bonds. My MP wrote to George Osbourne and received a reply from Lord Sassoon from the UK treasury. Despite the US figures now showing the UK owning $374 Billion, the letter from the treasury claims to only own $71 Billion. Something clearly is wrong, if the UK has actually purchsed $374 Billion they must surely be selling Sterling bonds to raise the money? ?